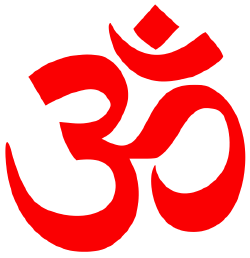 Aum ( ), also rendered Om, is the most sacred sound in Hinduism, symbolizing the infinite energy of divinity. This sound is sometimes called the Udgitha or pranava mantra (primordial mantra), because it is considered to be the primordial vibration of the entire universe including ourselves. 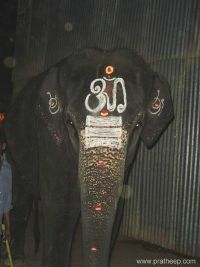 In India, the mantra 'Aum' is undoubtedly the most representative symbol of Hinduism, and its Sanskritic depiction (see image on right) is said to concisely encompass the vast storehouse of philosophy and mythology found in Hinduism. Indeed, Aum is so sacred that it is prefixed and suffixed to all Hindu mantras and incantations. 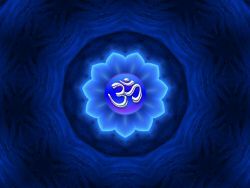 The Aum mantra first came to light in the Vedic Tradition of Hinduism, and is also considered to be holy in Buddhism, Sikhism, and some new religious movements such as Eckankar. The popularity of Aum beyond these Eastern religions seems to be fairly easily understood when we pay attention to modern physics, which has found rhythmic waves and vibrations from circular motions of particles in the world, and also when we look at more insightful aspects of the monotheistic religions where God is seen as a dynamic God of the vibration of love. Aum may not seem relevant to the monotheistic religions that tend to depict God as static and immutable beyond any motion. Nevertheless, a careful study of Christianity, as well as the Sufi traditions of Islam, show that these monotheistic religions, especially when at their insightful and revelational moments, depict God as a dynamic God whose vibration is love. For example, the Christian thinkers Karl Barth and Jürgen Moltmann have attributed the motion of love in the world to the dynamic trinitarian relationship within the Godhead. (It is interesting to note that Hinduism also discusses about Aum in terms of the three forms of God: Brahma, Vishnu and Shiva.) Alfred North Whitehead suggested that the universe is a "vibratory universe," and that it is a reflection of the dynamic reciprocity of the two poles of God centering on his desire of love: conceptual and physical poles.